Are you wondering why our diarist and her Mama are sewing little dresses and gowns when there was no way to tell if the baby was a boy or a girl? Me too. Mama cut out some skirts nighties & another flannel kimona for Baby & I tried my hand at Emb(roidery). I called up Ruth & asked her to send down a couple chickens. In p.m. we sewed a little while in Mrs. Andrews room & then went for a walk down town and looked at the big Sales. Warm thru the day but nippy in evening. Hard to imagine nowadays when expectant mothers factor gender into clothes and nursery furnishings, and friends give gendered gifts. Back then you laid in a stock of little gowns and that was what Baby wore, boy or girl. Beautiful shot of Streetcar #50, now restored, plying the snowy streets sometime in the 1920s. Our diarist probably climbed aboard plenty of times while she stayed in town, waiting to have her baby. Check out http://fortmissoulamuseum.org/index.php to learn more about this streetcar. Our diarist and her Mama sewed so much for the coming baby, and themselves, that their eyes ached! It must have invigorating, to say the least, to leave their stuffy rooms for the cold streets of downtown Missoula in search of food, friends, and after-Christmas sales. I emb. most all day for a.m.
Mama cut out a few new garments in p.m. I went down stairs and looked for emb. patterns part of p.m. Mama felt so bum & her head ached so much we layed down a little while then went down town for an airing. Mrs Muckler & Virginia also Mrs. Nelson & Esther called in Evening. My Dr. came also but late. I had toast & soft egg for B. a little rice, potator & venison cooked fine together for dinner & Oatmeal for supper. 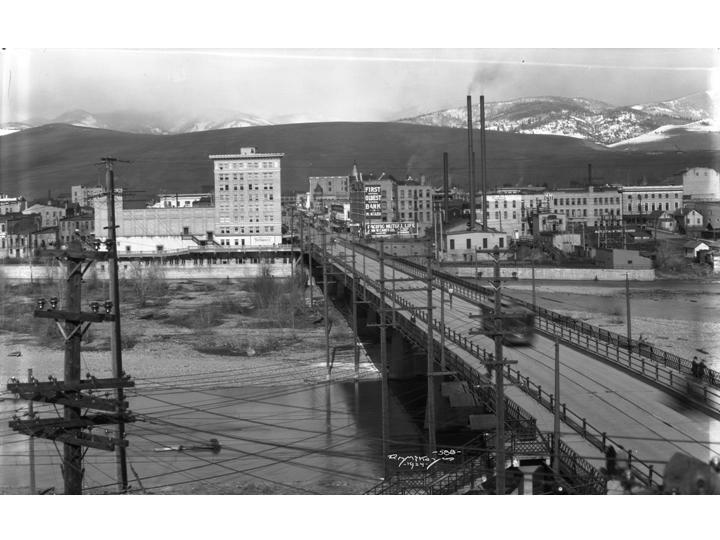 Missoula probably seemed like a big town to her, but it numbered only 12,688 souls in 1920 (two years before). Even today we haven’t hit the 67,000 mark yet. This shot facing north along the Higgins Bridge shows the city ran on steam heat–note the smokestacks. The riverbanks, now Caras Park, were weedy lots that probably flooded every spring–the Corps of Engineers hadn’t built the levees yet. The beloved Wilma Theatre, where our diarist may have gone to see a silent movie, shows its familiar pale beige side, and telephone line spaghetti is much in evidence. See the streetcar? Missoula pioneered the one-man operated trolley (first in the U.S.!) I could swear that the narrow walkways on either side haven’t changed: there is still only room enough for two (not very chubby) people to squeeze past each other. But it keeps us Missoulians friendly. To travel back in time and hear a bit of city life in the 1920s, check out this wonderful audio project featured on http://www.npr.org/blogs/thetwo-way/2013/10/22/239870539/the-sounds-of-new-york-city-circa-1920. Yes, New York was a little bit bigger — but it gives you the feel. When I was little I wanted to look just like silent screen star Louise Brooks, the “Kansas Cleopatra.” Isn’t she just the ‘bees knees’ in this kimono? I wonder if Mama had this glamor shot in mind when designing her own handmade version. Kimonos in 1920s Montana? You bet! Ray came up in the morning in a car & Mama & I rode back to our apartment then we went downtown. Got some outing flannel, two little dresses, & a coat for baby. In p.m. we were busy fixing patterns & Mama cutt out a skirt & kimona. I worked on putting the little emb. dress together. We got a little stuff for our hats & in evening I fixed my hat. Opal came after school & stayed all nite. Terrible windy & snowing cold. “P.m. Mama took them downstairs & stitched them & I sewed. Howard called a few moments. Ruth called up about 4:30. Got a pkg. of white goods. Opal stayed all night. Wrote letters to Corlett and did odd little sewing & Mama made or started an odd little kimona & underskirt. We went down town in p.m. & it was colder than the Dickens, coldest night this winter. Mrs. McDonnell spent the evening with us & Mrs. Day was up awhile. Kimona: not a garment I would associate with the American West in the 1920s, much less in a Montana winter. But this will teach me to respect the power and reach of fashion… Kimonos, or at least an American version of them, were all the rage in 1922 from coast to coast. Mama is clearly a devotee of the latest styles! Jay & I got out about day light. Had a time getting the fire to go so did not have our breakfast very pronto. Jay cut up quite a lot of the wood & packed some upstairs. Got his tradeing done before dinner & left for home about 2 p.m. I surely hated to see him go but tried to be a good girl & not a baby. Mama & I went down town about four P.M. & saw the Dr. He told me to try Oyster soup & Bananas so hurrah for me we had Oyster soup for supper. It was a big deal to have your husband leave, when home was nine hours away across the snowy Montana plains. I hope our lady diarist got some comfort from her fancy soup. Oysters are pretty scarce in Montana now, I can imagine how expensive they were in ’22. Have you ever heard of this movie star? Me neither. But maybe he made our diarist’s heart beat a little faster that cold night of January 11, 1922. I like picturing her in the dark theatre (perhaps the Empress or the Wilma (both on Higgins St., you can still watch movies in the Wilma today)– holding her cowboy husband’s hand and munching popcorn. They made crummy movies in the 1920s too. But at least they were silent. Our lady diarist goes on a movie date with her cowboy husband. Well, our diary writer is quite busy over the next few days, walking miles (pregnant and all) in search of a nice apartment to have her baby. She is also spending some time with her husband Jay before he heads back to the ranch. Mama is considerately staying with friends to give them some ‘alone time.’ Including a movie date! We went and looked at some rooms & then had breakfast. Went from there up to Nelsons & there J. & Mr. Nelson took a scout around looking for housekeeping rooms. Had dinner there then Mr. N Jay Mom & I about walked our shoes down looking for rooms. The men found in a.m. Went out to Randalls about 6:30 & stayed all night. Not such a bright day but melting some. Protagonist Barry Gordon (Rawlinson) has inherited a love of drink from his father. Because of this, he gives up his girl, Muriel Beekman to his brother, Tom, and goes to Paris. (Kinda like handing over your favorite dog, eh?) But then he finds out that brother Tom is missing in Morocco, so he goes to search for him. Muriel and her father are in Morocco too of course, and she tells Barry she always loved him best (again with the dog analogy). So they wed, and Barry discovers that his brother is being held for ransom. Barry offers up all his money, and himself, for his brother’s release, and is accepted. A native girl, however (thank goodness for those Native Girls!) helps him to escape and although he gets lost in the desert, he is eventually able to return to Muriel. Somewhere along the way, apparently, he has conquered his taste for booze, so everyone lives happily ever after. This is probably the view that our ranching lady saw from her perch on the wagon during the long trip to Missoula with her husband and mother. Today on the highway it’s 51 minutes from Ovando; in 1922 in the middle of winter it took them 9 hours! These beautiful draft horses live and work at Grant Kohrs Ranch National Historic Site in Deerlodge, MT. You can visit them anytime; the ranch is run by the Nat. Park Service.